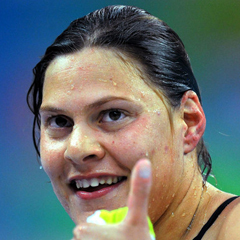 Cape Town - South Africa's Natalie du Toit has finished seventh in the women's 50m freestyle S9 final at the London Paralympic Games on Tuesday evening. Du Toit started strongly but faded towards the end of this explosive race, finishing in 29.84 seconds. China's Ping Lin won gold in 29.12 seconds, breaking Du Toit's Paralymic record of 29.20 at the Beijing Games in 2008. Du Toit though still holds the world record of 29.04 which she set in Manchester in 2006. Du Toit currently has 12 career Paralympic gold medals and two at these Games after her wins in the 100m butterfly S9 and 400m freestyle S9.